In Chapter 9, however, 1/3rd of the way through, something happens. A mother who abandoned her baby finds her with adoptive parents, and wants her baby back. This story-line takes off like fireworks skittering across the yard. The sense of shallow teenage-ness departs, and a heart wrenching story emerges with nuances and missed signals in relationships and situations. However, it isn't enough to rescue this book. The crises are unrealistic and mostly unbelievable, including a fire that is never really explained, an abortion that doesn't ring true, and life-styles that are simply fictionalized. The relationships are filled with lies and withheld truths, making them ultimately baseless. The characters are one-dimensional. All told, I don’t recommend you add this book to your list. It is neither profound nor believable. I can’t figure out why Little Fires Everywhere is a book club read. I will be interested to see what my book club members have to say. If I gain any different perspectives, I will share them here. I’ll be interested to learn what your book club thinks of this. I was disappointed. Even gave it a down-arrow in my rating system and that’s pretty rare (most books that I would give this rating I don’t finish reading). This title was highly recommended in reviews and on many “Best of…” “Must read….” lists. It never really grabbed my attention. I found the writing not smooth or flowing. Somewhat moralist in tone. The themes she wrote on – rich v. poor; starving artist v. socialite; clash of cultures – just didn’t ring true. I was tempted to stop reading a few times but kept on because it was so highly rated. Glad to see you had similar feelings, Andrea. Never thought of it as a YA book. I just finished reading Everything I Never Told You. It surprised me. I liked it. I thought the story ran true and there was much to gain from reading it. I would recommend it. I think the rave reviews for Little Fires Everywhere may have been based on the success of this book. Yes, I could see it as a YA book but with definite appeal to adult audiences. I’d say give it a try. Um, is Everything I Never Told You by the same author? Will you share a brief synopsis? Um, yes, same author (you mention this title in your review). Brief synopsis: The sudden death of teenager Lydia causes her family to reflect on her, their own lives, and family relationships. Also about being different. Lydia’s mother is Caucasian, her father Chinese. They live (mid 1970s) in a small town in central Ohio. 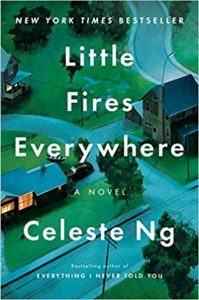 Unlike Little Fires Everywhere which we both thought was “unrealistic and unbelievable” (to quote you), I found the situations in this book to be very true. Good insights, good writing. Huh! It has some similar themes. Interesting. Thanks!